Was lucky enough to see the revived Frankenstein ballet at @RoyalOperaHouse last night, my first ever ballet too! It was absolutely fantastic. The colour palette and lighting was ???? #ROHfrankenstein wasn't really as good as I remembered. Too many characters and too much narrative stuff, actual dances were very few. Also, final act was a bit samey (hallucinated Frankenstein, creature conflicting with him and Elizabeth). Disappointing frankly. What did you think of Frankenstein? 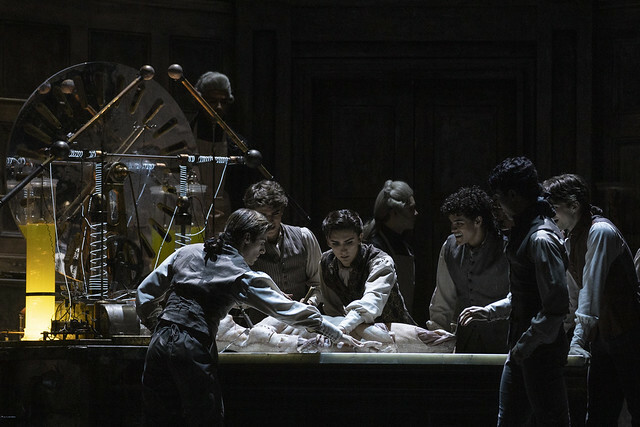 Share your thoughts via the comments below or by using #ROHfrankenstein. 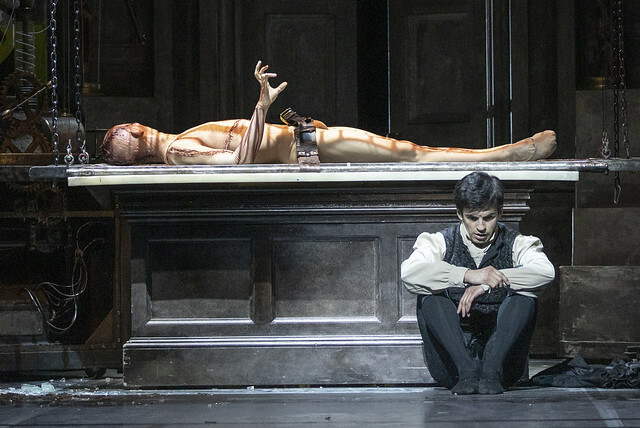 Frankenstein runs until 23 March. Tickets are still available. Frankenstein is staged with generous philanthropic support from Julia and Hans Rausing and the Friends of Covent Garden. I loved it,Liam Scarlett is a genius. I thought it was absolutely fantastic. Powerful, moving, disturbing & gripping. The sets by John Macfarlane are incredible. The critical response baffles me. Yes, you could make a few little cuts here and there but overall this is an amazing production. Yes this was an excellent performance. First time for me to see 'Frankenstein' live as I have been watching the DVD of 2016. Great dancing by all especially Wei Wang as the Creature and Ptolemy Gidney as William (someone to watch over the next few years). However perhaps the ROH could reconsider using a public auditorium announcement at the start of the performance where there is a late change from that printed on the cast list. On Tuesday I sat next to a young girl with her mother and they were not aware of the late change in Olivia Cowley replacing Itziar Mendizabal. Both daughter and mother personally know Olivia as the daughter is currently in one of Olivia's dance classes. Clearly not everyone sees the notices at the points of sales. Who is Ptolemy Gidney? I'm asking since he's not a member of the Royal Ballet. Student of the Royal Ballet School. He also danced Clara's brother at some performances of The Nutcracker this season and was excellent in that. Fantastic evening, in every sense! I've just returned home after Friday March 8 performance, with Tristan Dyer (Victor), Sarah Lamb (Elizabeth) and Ryoichi Hirano (The Creature). The front row of the Amphitheatre was the perfect seat! Tragic and moving story, and as it's among my favourite novels, it's great to see how Liam Scarlett has kept true to Mary Shelley's vision. Brilliant stage design and pyrotechnics, and of course sublime dancing from the whole company. I missed seeing this in 2016, though I have the BluRay and have watched it several times, and I often play it just for the music: Lowell Lieberman's score is excellent, and I hope it'll find its way onto CD soon. I wore my 'Slaughtered Lamb' (as in An American Werewolf in London) as a nod to the marvellous Sarah Lamb. Many thanks and well done to all at ROH. The extraordinarily high pricing of the tickets for this run is matched both by the hundreds of unsold tickets, and the Magic by which the unsold tickets get "sold" in the 36 hours before the performance....? The ticketing trickery so common in straight theatre has now perhaps infected the roh..? If true, a total betrayal of our standards...!? What a disappointment: a lackluster choreography lacking in imagination or vision. Musical score was jaded and lacking any imagination. The sets were wonderful and the lighting superb, sadly that effort was wasted on such a lemon. l felt a cold coming on in the break, it was the best thing that happened to me all evening! I saw the performance last night - 11 March. Apart from the execution scene - which I considered far too graphic for a fairly minor part of the narrative - it was excellent in all other respects. On the other hand, this was the first time in years of attending ROH that there were so many empty seats. At the time of purchase I thought it was a bit pricey so perhaps others did as well and declined to buy. I don't believe ballet lovers were influenced by the lacklustre critic reviews and thereby stayed away (we all know the Royal Ballet is brilliant) so it may be down to ticket price. Shame really. I’ve just seen an amazing performance of Frankenstein with Alexander Campbell in the lead role. A technically perfect dancer who can also act with emotion, but oh so under rated and unacknowledged by the ROH. The only photo of him in the programme ( at £8 a pop) apart from his resume, was in another role, yet he is credited with creating the role of Victor Frankenstein. Shameful really. The dancing was tremendous throughout the company. The production values were second to none and the projection design out of this world. It was only marred by the person next to me constantly checking her phone, the couple in front of me snogging all through the performances and two rude audience members leaving before the well deserved bows were taken. I’n from the North of the country, way past Birmingham and the Watford Gap, and expected better manner from the sophisticated South. I guess rudeness is everywhere. Victor, and the part where the creature read of his creation in the Notes or diary he found in the coat pocket. I enjoyed it overall, and did not understand the reviews. I found the hanging of Justine pretty jolting. I liked the part where the monster appeared and disappeared among the wedding crowd. Didn't really like the Tavern scene.. The usual ballet crowd seem to be avoiding this revival, so I am writing this to praise Alexander Campbell’s performance last night as Victor: remarkable, subtle acting to support his excellent dancing. Why on earth didn’t he take a solo call at the end?! The ballet has strong elements but desperately needs cutting: the first 20 minutes could be compressed; the tavern and execution scenes cut completely; and so on. Very few three-act plays have been created for at least the last forty years; a two-act structure would work better here, too. In its day, Shelley’s novel was cutting-edge stuff: it didn’t recycle tropes from two centuries earlier. Which reminds me: the ending as staged here is a travesty of Shelley’s novel. That needs to go, too. But I encourage Royal Ballet fans to see this, for some excellent performances. LOVED it, Wei Wang truely excelled. Together with “The Nose” I would rate this as one of the most entertaining performances we have seen the last few years (most months we try to attend a performance at the ROH). To be honest, my expectations were set rather low due to 3 rather critical reviews I read on my way to the ROH. Particularly the review by Mark Monahan in The Telegraph I found off putting. However, he could not have been more wrong! The Telegraph would do well to lay his pen permanently to rest. Fantastic performance, the PUBLIC obviously LOVES it! Well, I'm a member of the paying public, and you most certainly don't speak for me. And far from obviously loving it, the public is staying away in its droves, not because it's too expensive, but because it is unutterably bad, with poor dramaturgy (of a subject barely susceptible to choreographic treatment in the first place), endless amounts of undistinguished "filler" - the mauvais quart d'heure that opens Act III, the D.O.A tavern scene - the sheer lack of dramatic focus or even basic narrative skill everywhere apparent, and an ending that has nothing to do with the novel, appearing to consist of a slow-motion volcanic eruption somewhere in the Swiss alps. Uninspired and interminable to have to witness. Frank is right - the weekend was sold out; not a last minute ticket to be had if you hadn't booked in advance. The dancers are brilliant in this and the designs are attractive. A very interesting work that made me revisit the original novel. Please don't deprive the dancers of their front of curtain calls just because the audience (although loudly enthusiastic) has suddenly stopped clapping/cheering. Presumably the audience on Tuesday night was full of inexperienced ballet-goers who had got last minute discounted tickets and were unfamiliar with the routine of ballet calls. But if the dancers had come out for their calls, I'm sure the audience would have responded again. This was particularly unfair given that several of the dancers had given (very successful) debut performances. I first saw Frankenstein when it was live screened a couple of years ago and wasn't sure that it worked as a full length ballet. I saw it live last night and enjoyed it much more. The sets, costumes and lighting are magnificent. Liam Scarlett has ensured the story is very clear - and I found myself engaging much more with Victor and Elizabeth. It certainly builds very effectively to a climax in Act III - which is stunning to look at, exciting and moving. I think overall there is possibly too much story and not enough dance content. As others have said, there are sections that could be cut or shortened and the point where the creature comes to life is crying out for a solo for the Creature - and a duet for the Creature and Victor. Whatever the flaws in the ballet, I thought the whole cast last night was excellent - all of them - a fantastic team effort - with each person bringing their character to life. Special mention for Sarah Lamb - always so beautiful to watch; Tristan Dyer - wonderfully dark and brooding; Luca Acri - agile and engaging and Romany Pajdak - haunting and moving. More emphasis needs to be placed on the arduous task of creating the creature and the subsequent nurturing relationship. The rest of the ballet after this would then make more sense. Dancers were superb. Choreography timing was very poor and dancers clearly lacked synchronisation (not their fault!). Justine execution was unnecessarily graphic and disturbing. The university lab scenes are wonderful and FX were great as well. Decoration and backdrops were fantastic; minimalist, elegant and effective. Music score was great, but in my opinion it lacks motifs for the scenes/characters. I love the plot twist, though it also opens a lot of plot holes. In overall terms, it's a great production. Amazing!! I was captivated all along... It was truly epic! A ballet I recommend to people who have never seen a ballet and have to get a good one to be converted! Loved the ballet - hate this new website. Captivating indeed and very moving. I loved it the first time round but last night's production was absolutely amazing and kept me spellbound from beginning to end. Thank you Liam, John, all the dancers, musicians and those behind the scenes involved in this magnificent production. I much look forward to its return. Hmm, I read the crtics' reviews with interest but attended in spite of them. In retrospect, one wonders if any of them have ever read the book. The amount of narrative in this ballet is exceptional, but necessary. Even the much excoriated tavern scene has a point in highlighting Victor's increasing exlcusion and isolation. My only serious criticism would be the drastic rewrite of the story in the last scene: very dramatic but completely at odds with the novel itself. Well I thoroughly enjoyed tonight's performance. (23rd March) I had been 3 years ago and watched different leads except for Nehemiah Kish, who danced The Creature on both occasions - outstanding. Tonight I was spellbound, whilst the music is not one I would listen to as background to my daily routine like other ballet classics, this is so haunting and complements the mood of the ballet perfectly. Frederico Bonelli and Laura Morera were a delight to watch, the physicality, musicality and emotional engagement in their dancing led to an exceptional perfornance. Thank you to the Royal Ballet and the Orchestra for anoher lovely evening of ballet.